I was born on April 24, 1953 in Washington NC and lived the first 19 years of my life in and around Aurora NC. Come join me for the fun and adventure of remembering Growing Up In Aurora, NC. I love the fact that I grew up on a farm and in a farm community. There is no place like home. It is obvious that Larry feels the same. I am envious of his ability to remember and get written down for posterity, all the little things that made it a good childhood. My daddy was born and lived in Aurora also and I knew I'd be able to picture daddy in the scenes that Larry painted and I could and did. As Bob Hope sang "Thanks for the memories." Larry Gray says that growing up in eastern North Carolina in a small rural community was "the best possible childhood you could wish for." And it would certainly seem so from this loving, gentle and always entertaining memoir. He talks about the joys (and otherwise) of the local library, church, grandmomma's kitchen, basketball camp, the country store and much else. He writes with wit and style, with numerous amusing stories. Highly recommended. 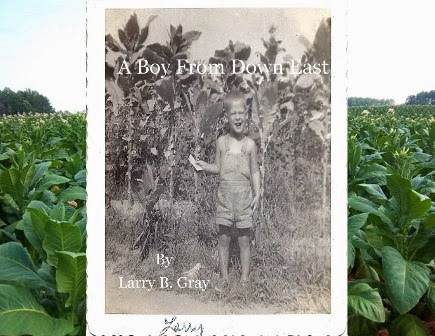 A Boy From Down East is an ambitious reflection on the 1950s and 1960s by Larry B. Gray, with its short chapters and coming-of-age structure. Those who lived during the same era and grew up on farms or in small towns will read through the pages with a warm smile of recognition on their lips. Others, who like me are generations younger or more familiar with city living will find great first-hand history lessons about the times when electronic devices weren’t used as babysitters; when involving children in the family business was considered a way to build character and not child labor; when a secret date behind a haystack only led to a stolen kiss. Though I believe that the world is constantly changing around us and we need to keep up with those changes, I also believe that reflecting on history is very important if we want to live better and learn from the mistakes of the past. While I was reading the author’s – now a grandfather – very personal recollections about his childhood, I realized how every word a child hears, every action he or she lives through, has a great impact. As a mother of two children, I got myself thinking about how my way of parenting will affect my son and daughter later in life. I’m sure others who pick up this book and read it will do the same. This is a very positive book; mostly descriptions of lovely memories fill its pages. In a world where the media and our society question the importance of family every day, it was refreshing to see that we parents, who sacrifice, who work hard to create a new generation of productive people, are doing the right thing. Family life does matter and it is very important. A wise and hardworking grandfather, a kind and home-making grandmother, a friendly neighborhood can make a world of difference in a child’s life. For better or for worse, we all have learned something from our close relatives and people with whom we grew up and around. If you don’t have any good examples in front of you, read Mr. Gray’s biography. If you are surrounded with positive influences, you should nevertheless read this book to fill your heart with warmth. I have received a copy from the author for an honest review. It is magic to hear the telling of part of your own life. Even if it is a brief portion. This author certainly captured the flavor of times I had a brush with. He fills in gaps and explains things about a real town and real lives, I could "taste" those good old days again. Read this knowing he is real, and the friendships and stories are as well. You will love Aurora too. 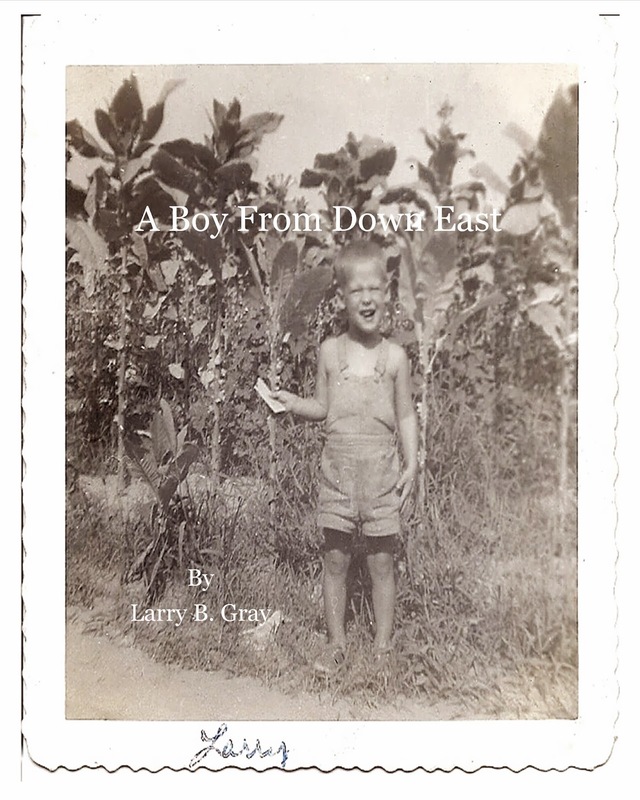 Print copy: Click Here to order your copy of A Boy From Down East from createspace.com. Own a shop or store? Would like to sell A Boy From Down East? Contact me to discuss terms. I grew up in Eastern North Carolina in the small rural town of Aurora. My early years were spent working on my grandparents' tobacco farm and exploring my world of family, friends and school. After marrying my high school sweetheart in 1972, I moved to Lakeland, Florida where I spent my adult years raising a beautiful family and working in the citrus industry with over 39 years of manufacturing management experience, selling realestate and being a writer wannabe, all at the same time. In my spare time I attended and graduated from Florida Southern College while working full time and starting a family. I am still married to my high school sweetheart and have 3 beautiful children and two wonderful grandchildren. Life is not always easy but in the scheme of things it is fun and gets better everyday. Come join me on this great adventure, remembering the past and building the future. The owner of this website is an affiliate for providers of goods and services mentioned on this site, and may be compensated when you purchase from a provider. The owner accepts no responsibility for goods and services purchased. Copyright © 2012 Larry Gray. All Rights Reserved.. Watermark theme. Powered by Blogger.